Hike Emerald Lake with one of the country's best naturalist guides. 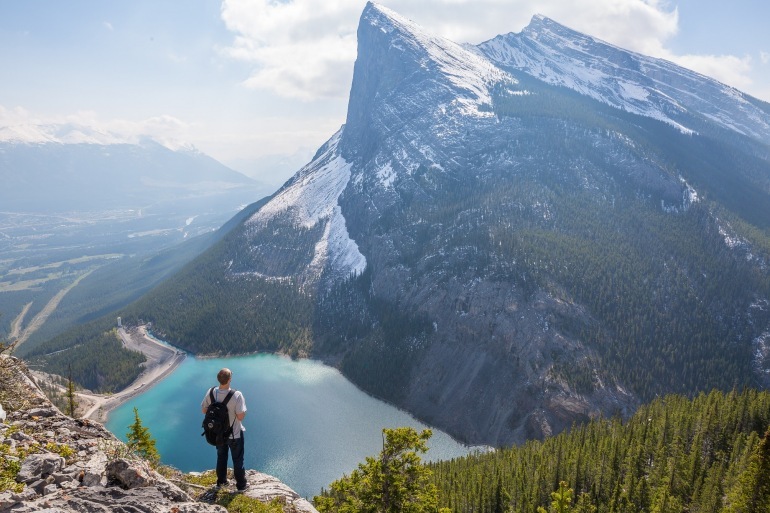 Hike Emerald Lake with a naturalist guide, enjoy a lesson in nature photography, ride across the Athabasca glacier, enjoy a barbecue lunch near Sunwapta Falls and float down the Bow River in Banff. Arrive in Calgary, where you are met and transferred to your hotel. Tonight, gather with your fellow guests for a cocktail reception and welcome dinner. Drive through the Bow Valley to Johnston Canyon, with its sheer walls, waterfalls, tunnels and pools. Stroll the interpretive walkway before heading to glacially-fed Moraine Lake in Banff National Park. Later, get a hands-on lesson in the art of wildlife and landscape photography from a professional photographer. Try your skills on one of the most picturesque lakes in the Canadian Rockies. Finish your day at your luxury hotel on Lake Louise (5,700 feet). Travel through serene Yoho National Park to Emerald Lake, which owes its vibrant color to the glacial sediment in its waters. Meet with your expert guide, who reveals the geological and natural forces behind this scenic lake, and describes the breathtaking natural surroundings and habits of the endangered local grizzly bear. After lunch, weather permitting, pause at Takakkaw Falls, Spiral Tunnel and Kicking Horse Natural Bridge. The remainder of the day is at leisure to explore Lake Louise at your own pace. Travel the scenic Icefields Parkway, along the backbone of the Canadian Rockies. Named after the sprawling ice fields in the area, this is one of the world’s great drives, with roadside wildlife a common sight and vistas of verdant forests and soaring peaks all around. Stop at the massive Athabasca Glacier (7,200 feet) for a thrilling ride across its surface on a specially designed vehicle. You also visit lovely Sunwapta Falls, enjoying a barbecue lunch and lecture by a local park naturalist in this beautiful, remote setting. After lunch, continue to magnificent Jasper National Park, via Crowfoot Glacier. Cruise along the mile-high Maligne Lake to the famous Spirit Island, a tiny islet surrounded by the towering snow-capped Rockies. You may opt to join your fellow guests for a guided hike through the Maligne Canyon, with its impressive 200-foot-tall limestone walls. Later, return to your lodge, where the remainder of the day is at your leisure to enjoy its natural surroundings and amenities. Bordered on all sides by wilderness, Banff is a national park resort community surrounded by spectacular nature, home to roaming deer, elk and other wildlife. Begin with a relaxing and memorable float trip down the majestic Bow River. The rest of your day is at leisure to enjoy Banff at your own pace, perhaps exploring the community’s restaurants, galleries and unique shops. This evening, gather with fellow guests to attend a special farewell dinner. Depart for the airport and your return flight home. This journey will have some active elements. First group event: welcome reception at 6:30 p.m. on Day 1. Last group event: Calgary International Airport arrival at 12:00 p.m. on Day 8. All group journeys excluding Connections European River Cruise, Expedition Cruise, Private Jet, Wings Over the World and Inspiring Expeditions by Geoffrey Kent are guaranteed to operate with a minimum of two (2) persons. Guaranteed departures will operate except only in cases of force majeure, which could include any major world event adversely affecting international travel patterns or other circumstances beyond A&K's control. The A&K Price Assurance applies to all group journeys available through A&K excluding Expedition Cruises, Private Jet, international and internal air and extra services. The A&K Price Assurance applies only to 2016 advertised rates on abercrombiekent.com for the same program, travel date and accommodation classification. A&K reserves the right to modify or cancel the A&K Price Assurance for future bookings without prior notice. It is the guest's sole responsibility to obtain and have available when necessary the appropriate valid travel documents. All guests are advised to check with the appropriate government authority to determine the necessary documents. A valid passport is required for U.S. citizens travelling to all international destinations. Passports must be valid for six (6) months after the return of your journey and should also have sufficient blank pages for visas and immigration stamps. Many destinations also require a visa for U.S. citizens; this will be indicated in your Pre-Travel Documentation. Non-U.S. citizens should contact the appropriate consular office for entry requirements pertaining to their journey. You may be refused boarding or disembarked from a vessel without liability for refund, payment, compensation, or credit of any kind if you do not have proper documentation, and you will be subject to any fine or other costs incurred by A&K which result from improper documentation or noncompliance with applicable regulations.